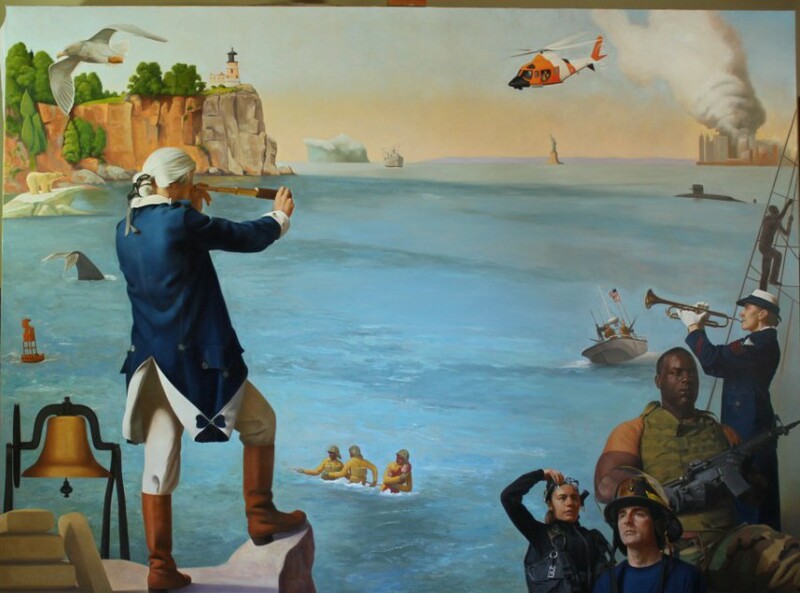 The Coast Guard painting was installed, and here is a gallery that highlights the day. Models spend a lot of time at the studio posing, and here are a few images of some of them. Staff Sergeant Kevin Hurt initial pose. 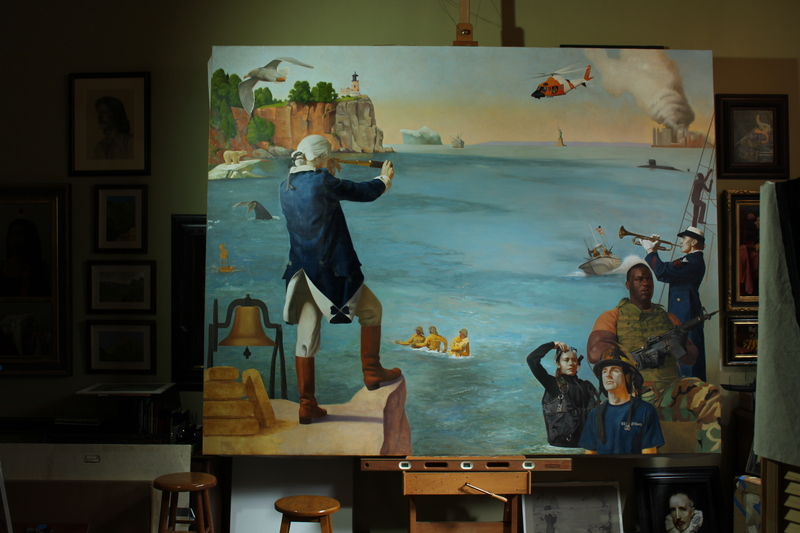 The Coast Guard painting was in the Duluth Depot for a week in January. A highlight of its time there was having the Coast Guard’s Honor Guard in attendance for the press conference–a regal and fitting tribute. 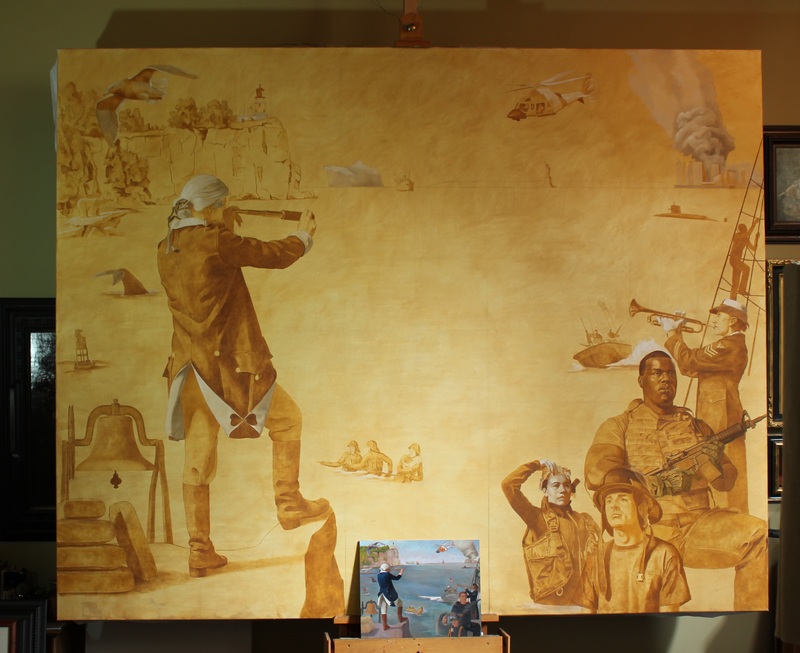 The Depot has hosted the Army and Navy paintings, and again a great host for this, the 3rd of five paintings. Special thanks to staff from the St. Louis County Historical Society, including: David Boe, Veterans’ Memorial Hall Program Manager; JoAnne Coombe, Executive Director; Mary Parks, Director of Museum Operations, Dan Sershon, and the members of the Coast Guard Honor Guard. Below is a series of photographs from the conference. 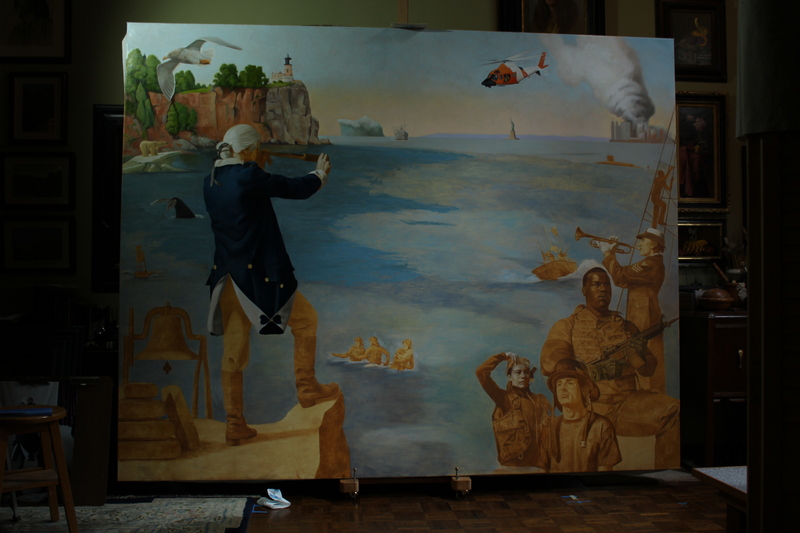 December is here, and as of this weekend, we are just 2 months out from installing the Coast Guard painting in the Committal Hall. I can see the end in sight, and upon installation, the project is 3/5 complete. Autumn is approaching, and despite the allure of the nature’s colors, I have been doing a lot with my own color–as you can clearly see. 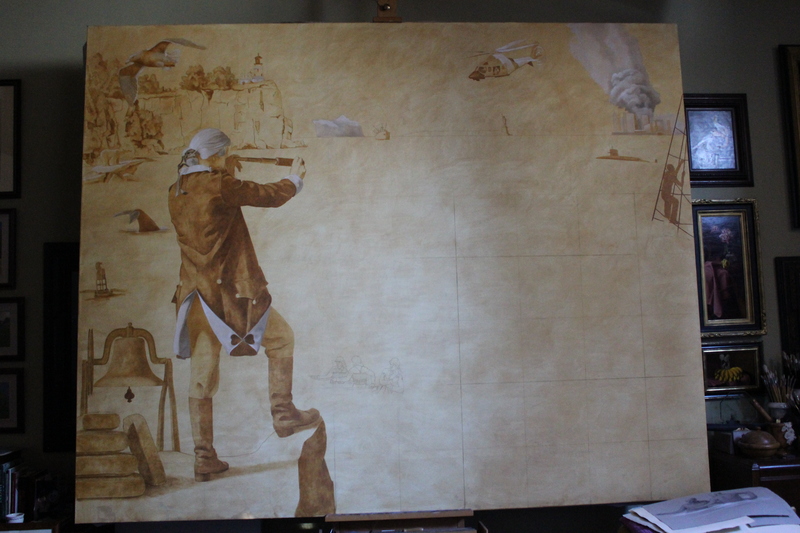 Much paint has been added, notably the lower right and the main figure. Summer is not slow in the studio. Much paint has been added in June/July, and whether it’s hot and humid, or raining, work must go on and the water–a critical element for the Coast Guard–is really starting to show. I’ve been working with a lot of blue. Painting makes great progress as of May 2015. Read more on the project from the St. Cloud Times at Memorial Day marks progress for Little Falls artist. And thank you to ALL of our men and women in each branch of the military. 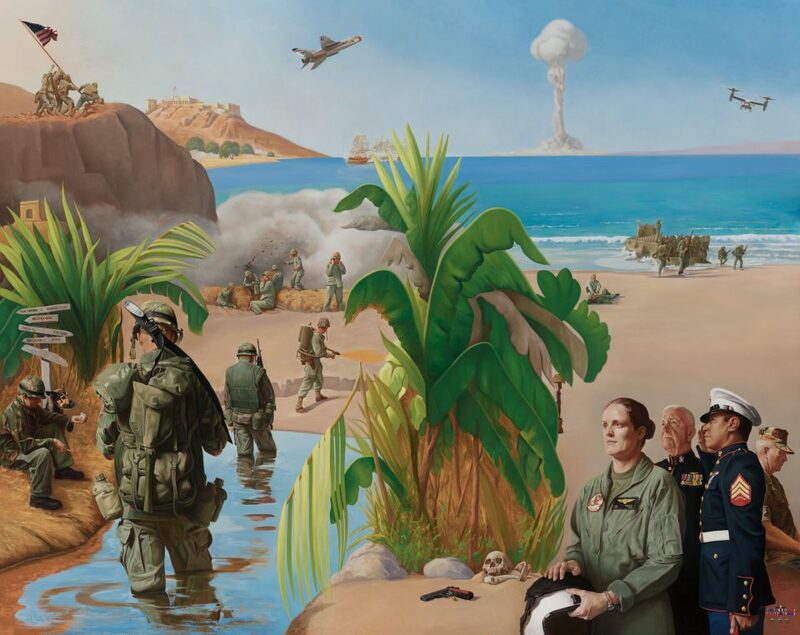 Kapsner captures the “soul” of the military in memorial art from the Morrison County Record, March 14, 2015. HOW DO THE IMAGES GET CHOSEN? Live models come to the studio and pose, sometimes once, sometimes for multiple sittings and pose in uniforms ranging from historic period uniforms to current-day gear. Shown here are three models who have contributed their time and energy. You can readily see how the “pose” becomes reality on the canvas. Further, actual events are captured that influence the painting–e.g. commemoration of 9/11 where the U. S. Coast Guard was responsible–using a makeshift fleet–to evacuate nearly half a million people from in and around Battery Park.